Current Ambassador to China and former Iowa Governor Terry Branstad donated $1,000 to the campaign of Randy Feenstra, the Republican primary opponent of Steve King, newly-released fundraising numbers show this afternoon. It’s the latest sign that key Iowa Republican leaders have had enough with the behavior and controversies of King, hoping to see him ousted in a primary rather than the general election. Finance records put out today show Branstad making the donation on March 14. 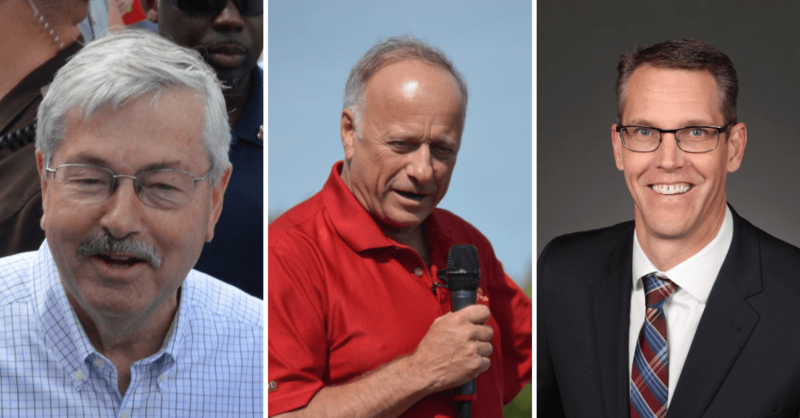 Branstad is the highest-profile Iowa Republican leader yet to publicly show their support for King’s challenger, though he has not publicly endorsed yet. Feenstra, a state senator, reported raising just over $260,000 in the 1st Quarter of 2019, which his campaign said is a record for a first-time Iowa Republican congressional candidate for this time period. It’s an important first step for Feenstra, helping him show to additional Iowa and national donors that he’s a legitimate contender to take on King for the party’s nomination. King’s fundraising report is not yet online. The 4th District is by far the most Republican seat in Iowa, one that Donald Trump carried by 27 points in 2016. King typically won by very large margins, but he came within just three points in near-massive upset in 2018 against Democrat J.D. Scholten. King’s history of racist and inflammatory comments finally caught up to him that year, exacerbated by his quotes that seemed to defend the term “white nationalism.” National Democrats have already shown significant interest in the 4th District race this year, assuming that King will end up as the nominee again. The considerable national fallout for King (he was stripped of all his committee assignments this year) had already spread to fellow Republicans in Iowa, though Governor Kim Reynolds and Senator Joni Ernst have only distanced themselves from King’s specific comments. Feenstra has received the endorsements of former Speaker Chris Rants, former Senate Majority Leader Stew Iverson, Senator Waylon Brown, Senator Dan Dawson, and State Representative Dan Huseman, among others. Branstad is not the only noteworthy Republican leader or business owner to show up in Feenstra’s filing. Former State Senator Rick Bertrand, who unsuccessfully challenged King in a primary in 2016, contributed $5,600. Former Branstad chief of staff and 2002 gubernatorial nominee Doug Gross gave $1,000. Kum and Go owner Kyle Krause, Pizza Ranch owner Adrie Groeneweg, Schuster Trucking owner Steve Schuster, CRST chair John Smith, Steve Sukup of Sukup Manufacturing, former Congressman Tom Tauke, four members of the Doll family of Doll Distributing, and Pella businessman Bob Vermeer all appear on Feenstra’s donor list. Doug and Janet Boone contributed the maximum to Feenstra. They were c0-chairs of Reynolds’ inaugural committee. National conservative writer Ben Shapiro, who encouraged his followers to contribute to Feenstra, contributed $2,800 himself. One other Republican, Woodbury County Supervisor Jeremy Taylor, is also in the primary. Taylor announced that he raised $58,000 in the 1st Quarter. No Democrat has announced for the 4th District race yet, though Scholten has publicly stated he’s considering another run.